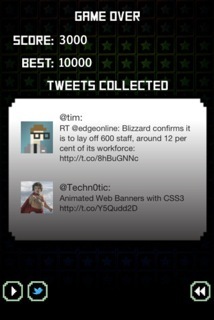 My good friend Andy Girvan, a London based freelance web and iPhone developer has recently launched Social Break – a brand new iPhone game that is essentially a mashup of a classic arcade game and Twitter. The game itself is in the same style as the arcade classic Breakout, with the twist being that when you hit special Tweet blocks, it shows you a recent Tweet from someone you follow – the whole idea being that Social Break is “the fun way to check Twitter”. Thrown into the mix are a challenging set of positive and negative power-ups, to keep players on their toes in what is a hugely enjoyable game. I’ve been playing Social Break over the last few days and found it lots of fun. 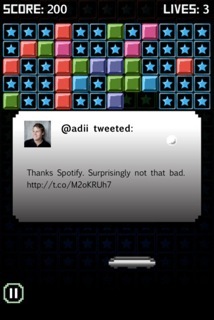 Given that Breakout is probably one of the most addictive games ever and the popularity of Twitter, Andy and his iPhone app developer outfit Wicked Little Games could be on to something special here. You can download the game at http://bit.ly/socialbreak for £0.69p/$0.99. Andy has kindly given readers of Social Web Thing some promo codes to get Social Break for free. If you’d like to receive a code, leave your Twitter handle below and I’ll DM it to you. Just to let you know there is now a free version of Social Break available at http://bit.ly/socialbreaklite – the same game, just ad-supported and no game center leaderboards. Thanks for the update, Girvs!